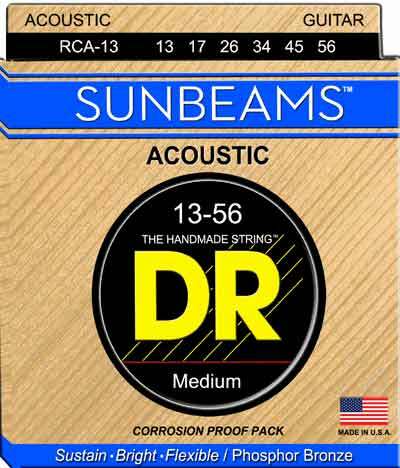 DR Sunbeam phosphor bronze acoustic guitar strings are hand wound upon round cores which give a remarkable sustain. I love Sunbeams on my mahogany and cedar Lowden O. They have a lot of sizzle, detail and insane glowing warmth. Being round core, they have a 'looser' feel to them that feels good on the hands. The price is also very reasonable compared to extended life strings. They start to die after about 10-12 hrs of playing - which is good for non-coated strings. I run .013 - .056 tuned D-D.